The McDonnell-Douglas F-4E was the final new-production Phantom II to be built for the USAF and incorporated many features that the often Byzantine air war over Southeast Asia dictated as absolute necessities for modern aerial combat. One lesson to be re-learned was the need for a built-in gun to service targets otherwise too close for optimum missile engagement. To accommodate the service’s standard M-61A1 20-millimeter Vulcan cannon, the nose was lengthened to provide space for the weapon, the electro-hydraulic drives, and its 639-rd ammunition magazine. A new fully-transistorized search-and-track radar and fire control system was installed forward of the cannon which required less interior volume and allowed for a smaller diameter radome. With the solid-state avionics package, the savings in internal space allowed for inclusion of an extra fuselage fuel cell which gave the F-4E slightly more un-refueled range. Up-rated J-79-GE-17 engines producing 17,900 lbs of thrust in afterburner were installed, offering a substantial increase in available power over the earlier C and D models. To decrease buffeting at slow speeds and high alpha angles the slotted stabilators first fitted to the Navy’s F-4J were used. Non-visible changes to the F-4E included deletion of the boundary layer control system, the ram air turbine, and the hydraulically-powered folding wings. Post-war improvements would later add an auxiliary power unit, maneuvering slats, the ARN-101 digital navigation system, the TISEO electro-optical system, and numerous other avionics and electronic countermeasures enhancements. The F-4E was certified to carry and deploy virtually every weapon in the USAF arsenal including electro-optical and laser-guided “smart weapons”, conventional “dumb bombs”, Maverick missiles, sub-munition cluster bombs, napalm, and the full spectrum of air-deliverable “special weapons” to include the B-28, B-43, B-57, and B-61 devices. Standard air-to-air missiles included AIM-4 Falcon, AIM-7 Sparrow and AIM-9 Sidewinder varieties. The F-4E served the United States Air Force as a front-line combat aircraft for over twenty years, performing magnificently as a fighter, an all-weather interceptor, a strike/interdiction aircraft, and a close air support platform. Many Western-aligned foreign air forces also chose the F-4E, specifically Greece, Turkey, Japan, Korea, Egypt, Iran, and (temporarily, pending delivery of their General Dynamics F-111Cs) Australia. Now nearly all surviving aircraft have been converted into pilotless drones for the most part, to be ignominiously blasted into smithereens by some 25-year old Hottentot in a Hornet. Perhaps ‘tis better than forlornly baking away in the Arizona desert, awaiting the elements of sun, rain, wind, and time to reduce these airframes to their basic molecular elements. The F-4E will soon be gone but its history of accomplishments will be difficult if not impossible to surpass or ignore. 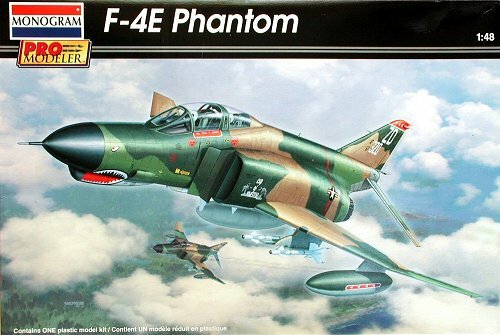 ProModeler’s F-4E is a re-boxing of the basic Hasegawa kit with a couple of bonuses. For those unfamiliar with the original offering, this kit contains 142 parts molded in light gray, a pair of clear sprues with 14 pieces, a comprehensive decal sheet with markings for five different schemes, and an assembly pamphlet with a well-ordered and illustrated set of plans, painting specifications with the colors annotated to FS 595 standards, and a brief history of the aircraft. The kit is engineered conventionally with right/left fuselage halves, a three-piece wing, and individual parts for the nose extension and radome. The intake trunks, while somewhat shallow, feature the correct bleed-off vent configuration top and bottom, and separate intake ramps to allow for easy painting. Surface detail is recessed on all major components with the gun gas purge vents on the underside of the ventral fairing particularly well-executed. The interior consists of a main tub to which the instrument panels, control yokes, rudder pedals, and seats are attached. The panels and side consoles are well done though the seats could benefit from some additional detailing or outright replacement with aftermarket resin accommodations. True Phantom Phans may wish to correct the WSO’s instrument panel as the kit provides that of the earlier F-4C/D. A pair of three-piece pilot figures are included for optional use. The landing gear is fully detailed with separate struts and retraction jacks, wheels of the proper width and configuration, and the requisite number of strut covers. The arresting hook is a two-piece affair, separate from the fuselage halves. Clear parts are provided for the landing/taxi lights, to be fitted to a bezel attached to the forward nose gear door. The auxiliary air doors are correctly molded as slightly ajar (these are open whenever the landing gear is lowered). The external stores consist of a pair of 370-gallon wing tanks, a 600-gallon centerline tank, four AIM-7 Sparrow missiles, four AIM-9 Sidewinder missiles with launch rails, and a pair of LAU adapters for each of the inboard pylons (stations 2 and 8) to allow carriage of four AIM-4 Falcon missiles though none of the latter are included. Both the early short and later extended (MIDAS IV) muzzle brakes are furnished, giving the modeler some time-frame latitude. Two complete sets of canopies are available--one, a four-piece assembly to allow for open cockpits, and the other a single piece affair to facilitate a closed-up interior. This latter part was first tooled for Hasegawa’s QF-4B/N and (to my knowledge) is not included in their home-grown F-4E kits. A boarding ladder is included for use if the open canopy option is chosen. This also was a standard feature of the earlier Hasegawa F-4 kits but has been AWOL in their later boxings. This kit shares many components with other versions exigent in Hasegawa’s Phantom roster and some vestigial lineage is apparent from such modular design. On the forward fuselage are three small wedge-shaped antennas which belong on the F-4G Wild Weasel but must be removed for the E model. Likewise the wings exhibit the lumps and bumps typical of an F-4J. The instruction sheet makes note of these and the necessary minor alterations are quickly and easily accomplished. 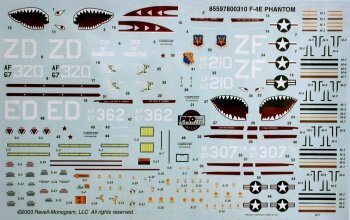 Unlike the typical fodder Hasegawa supplies for its decals, this ProModeler kit includes a spectacular sheet of aftermarket quality printed by Cartograf of Italy featuring markings for four aircraft (one plane has decals for two different time-frames) and substantial amount of stenciling, to include proper markings and stripes for all eight missiles. The main sheet is supplemented by a small addendum as the reds used on the standard decal were incorrect, being closer to terra cotta than a true insignia red. The specific aircraft featured are: 67-0320 of the 476th TFS, 31st TFW and based at Homestead AFB, Florida. This shark-mouthed aircraft was named “City Of Homestead” and artwork for both the 1969 and 1970 incarnations are furnished; 67-0210 of the 307th TFS, 31st TFW at Homestead AFB, Florida. Also sporting a shark-mouth, this aircraft was named “Kelley’s Heroes” and features a single MiG kill; 67-0307, another shark-mouth from the 307th TFS, 31st TFW at Homestead and the personal mount of the wing commander; and finally 67-0362, the F-4E flown by then-captains Steve Ritchie and Chuck DeBellevue on their double MiG-killing mission of 8 July 1972 (PLEASE……no shark-mouth on this aircraft!). Note: some of these schemes are wartime markings worn by the aircraft when the 31st TFW deployed to Thailand in 1972 during the “summer help” program to beef up the 432nd TRW prior to Linebacker II. Also, some of these aircraft did not have the fuselage and wingtip slime lights when these markings were used—photo references should be consulted to ensure absolute accuracy. This kit is an honest-to-goodness bargain in today’s age of imported and overpriced styrene. For less than thirty Yankee dollars the modeler gets a relatively state-of-the-art kit that fits well, looks good, and doesn’t require spending huge sums on aftermarket accessories of nebulous merit, replacement decals of dubious accuracy, or ordnance sets with the attendant over-bloated retail costs. What ProModeler has done is improve an already-proven product and deliver it to the consumer at roughly two-thirds the cost of Hasegawa’s “real McCoy”. I applaud them and will recommend this kit without reservation. 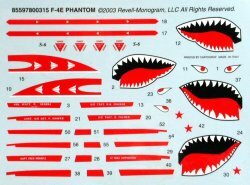 I’d like to see ProModeler to continue this symbiosis with Hasegawa and re-box several other Phantom kits in the line. Who’s up for an F-4B? Editor's Note: Though Roger didn't specifically note this, this kit is an early unslatted E and as such is not appropriate for most post-Vietnam war schemes. It is highly recommended that one have a photo of the plane in question to ensure that the aircraft you are modeling is configured the same way as the kit. It also has a combination of raised and engraved panel line sprues as is typical of most Hasegawa kits where some of the early common sprues are used.